HGS testing is well tolerated by patients with cancer. Testing for handgrip strength (HGS) — a predictor of all-cause morbidity and mortality — is well tolerated by patients with digestive cancers and health care providers, feasible, and affordable, according to a study published in Cancer. The relationship between cancer and malnutrition, and by proxy muscle mass loss, has been investigated, but there is a paucity of data for dynapenia, or weak strength. Although dynapenia and weak HGS are associated with poor outcomes in patients with cancer, it is not routinely assessed in this population. For the prospective FIGHTDIGO study, researchers recruited 203 patients with digestive cancers to perform the HGS test before, during, or after chemotherapy in the cancer unit for 6 months. 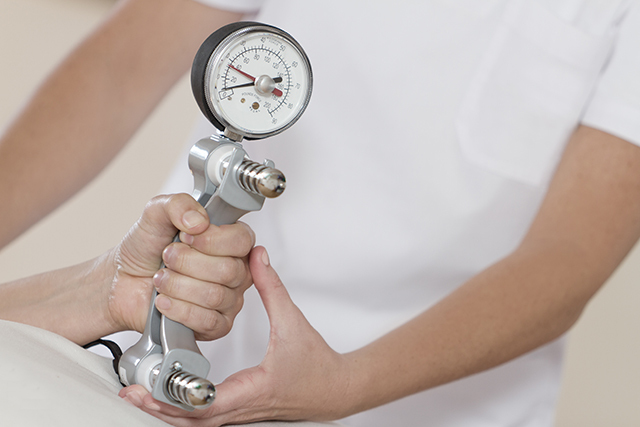 HGS was measured using a hydraulic dynamometer, and patients performed 4 measurements per evaluation. A questionnaire assessing the acceptability of the HGS test was administered after 3 months of follow-up to patients and medical team members. Of the 203 recruited patients, 201 (99.0%) were able to complete at least 1 HGS test during the follow-up period, and 190 (94.5%) were able to perform all expected measures. There were 1716 hospitalizations that allowed for potentially 1716 assessments, and 1704 were completed. One-hundred seventy-one patients completed the questionnaire, of which 164 (95.9%) reported that the test was easy to complete, and 176 (97.7%) reported that the test was not restrictive. Medical team members surveyed did not find the test restrictive or difficult to perform, and did not report negative effect to their practice or quality of care.